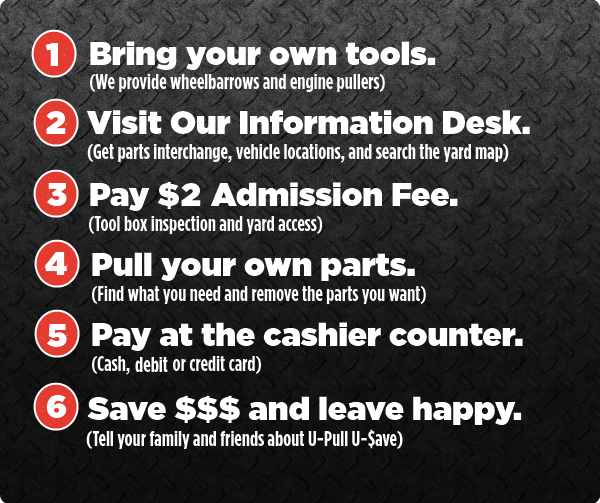 How It Works - S&W Automotive Parts, Inc. | S&W Automotive Parts, Inc.
U Pull U-$ave is a self service salvage yard. We provide you with a yard packed full of late model trucks, vans, SUV’s and cars, both foreign and domestic. You pull the part yourself with your own tools. Stop by today and let us help you find the part you need. Payments: We Accept Cash, Visa, MasterCard, and Discover. Debit and Credit Cards. Tires and Electronic Control Modules (ECMs) are sold “as is”, and there is no warranty available. All sheet metal items such as hoods, doors, deck lids, fenders, etc., are not returnable, so please inspect these items thoroughly before purchasing. Anyone not following the safety policies of the yard will be asked to leave immediately. No smoking is permitted in the building or in the yard. Smoking is permitted in the parking lot only. 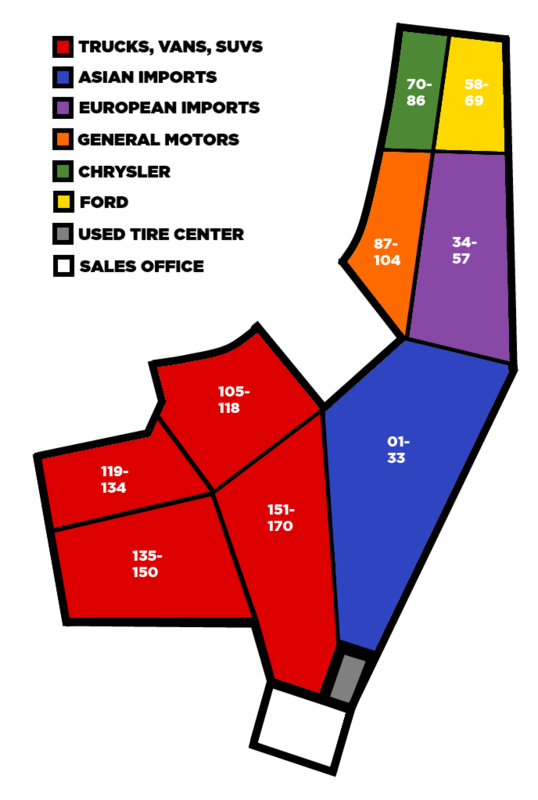 Children and persons under the age of 16 are not admitted into the parts yard. Our vehicles are placed on wheel stands to provide easy access to the underside of the car. If you have an issue pulling a part because of the location or height of a vehicle, locate a member of our staff for assistance. Jacks and pry bars are not allowed for safety reasons. Battery powered tools and sawzalls are allowed, however, please do not bring cutting torches, compressors, or power saws as they are not permitted into the yard. We strive to maintain a clean and debris-free yard, however you must wear closed-toed shoes for safety (no sandals, flip-flops etc.). Alcoholic beverages and drugs are forbidden on the premises. We reserve the right to refuse admittance to anyone who, in our judgment, is impaired and represents a safety concern to themselves or others. For your safety, various areas of the yard are prohibited from entry. We ask all customers to respectfully watch for these signs and keep out of these areas for the safety of our staff and our customers. Firearms, explosives, and other destructive devices are not permitted on our property. As a courtesy to other customers, parts that are removed, but not needed, should be left with the vehicle they were removed from.